Imagine your shock after battling your way through the collective works of the ancient Greek philosopher Aristotle, only to discover you’ve heard a lot of it before. Then, it clicks. But then, after checking the dates, you’re forced to sheepishly admit it’s the other way around. People have been remixing the wisdom of Aristotle for more than 2,000 years, and we’re all the better for it. Taking timeless truths, communicating them in the language of the present day, and applying them to new ways of doing things will always be a winning approach that provides true value. So, I’ll go ahead and take a crack at it. My guess is that if Aristotle were alive today, he’d be blogging. And he’d also be in the Technorati Top 100 quicker than you can say Guy Kawasaki five times fast. So, without further ado, here’s some old school blogging advice from way back in the day. Knowing where you’re trying to go before you start is crucial to leading an effective life (and handy for road trips too). Aristotle called this teleology, which is the study of matters with their end or purpose in mind. Fans of Stephen Covey will recognize the concept from The 7 Habits of Highly Effective People. The same principle applies to any persuasive writing, and with a blog it’s applicable to both your big story as well as to individual posts. The overall story that a business blog is trying to tell is tied into your unique selling proposition, and you need to have a clearly-defined big picture perspective of how you’re going to tell that story over time. You do that by telling smaller stories (otherwise known as blog posts), and, without unnecessarily taking the fun out of blogging, those smaller stories should each have a clear individual point and reason for being. Even if it’s just to make your readers smile on a Monday. Each post in some way should be also telling a part of the bigger story that demonstrates to your readers that they will benefit from doing business with you. There’s a million different ways to do that, and developing your own unique style is as important as any other advice you might get. Just always remain focused on where you’re trying to end up. Even when the path disappears, you’ve got to remember where you’re trying to go. Aristotle nailed the key to persuasion way back in Rhetoric, his detailed attempt to demonstrate that persuasion was a true art, contrary to the assertions of his mentor, Plato. Aristotle said that persuasion involved being able to identify the most compelling naturally-occurring element of any subject. 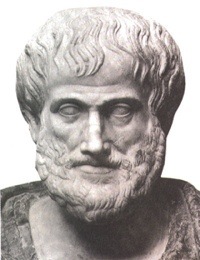 Once identified, Aristotle argued that the most compelling way to communicate that natural element is via pathos, the ability to connect with the emotions, desires, fears, and passions of the audience. And you certainly don’t accomplish that by focusing on yourself. Quick summary: Identify a true and compelling benefit, connect with the reader on an emotional level, then back it all up with features and logic. You’ve heard that from me before. You’ll likewise spot Aristotle’s wisdom in just about any book ever written on marketing and advertising. Your ability to communicate what’s in it for them in a meaningful way has never been more critical than it is now. Exordium – This is your opening. You’ve caught their interest with your headline, but the opening is where you’ve really got to grab hold for dear life. It might be a shocking statement, an interesting factoid, a famous quote, or a vivid anecdote. Narratio – Next you’ve got to show the reader you understand their problems. They need to identify with you, and you with them. In this section you demonstrate that you feel their pain. Confirmatio – The solution appears. Use vivid imagery to illustrate that the technique or service you offer is the answer, and give examples featuring people similar to the reader. Peroratio – Don’t’ forget to expressly state the need to act upon the solution offered now. This is the call to action, and it’s crucial, yet so many people simply stop at the confirmatio. As Aristotle might say, you’ve got to close the deal. The point I hope you take away from this post is that you’ll see certain timeless truths again and again in the world of marketing. How those truths eventually resonate with you depends on who tells you the right story at the right time. So, it might be Seth Godin who gets through to you. Or maybe it’s Harry Beckwith. Or Joe Sugarman. The same applies to you and your business. Someone in your field is going to connect with that motivated prospect and convert them into a customer or client. If you’re telling compelling stories, and your competitors can’t be bothered to, who’s that someone more likely to be? Subscribe to Copyblogger for more blogging advice. filed under: Blogging, Copywriting, Persuasion, What's Your Story? Somehow, Aristotle reminds me of Nostradamus. Many of Aristotle’s works were never recorded by himself. They are merely protocols of his lectures, written by his students. And just like many other student’s protocols, they are often not very accurate and need a lot of interpretation. So people do interpretations. Lots of them. Just like with Nostradamus. Florian, I think who you’re actually referring to is Socrates, who preceded Aristotle and Plato and never wrote down his teachings. Such a great blog. Thank you very much for your fantastic posts. I don’t know much about Aristotle’s other workings, though. Florian, that’s interesting — I have never heard that before. I don’t think there’s any doubt that he authored Rhetoric himself, and I had thought the same was true for Poetics. The only point I’d add to this when writing selling copy is that the reader wants to know what’s in it for them — “and how much.” Readers use the “how much” to evaluate the value of what the writer is offering. Great insight as always, Brian. You raise some interesting points, but I must beg to differ on one key claim: That Aristotle would be a top blogger, in the Technorati top 100. See, the peculiar thing about old Aristotle was that he was a crack rhetorical theorist, a rhetorician, but not a particularly good rhetor. In reality, while he did teach Alexander the Great, he reportedly was bald, didn’t have a good voice, and was a poor public speaker. Public speaking venues were the “blogs” of his day, and it was important business, with the law courts and all. A regular booming business, to be able to teach speaking and writing. Some people who did it got filthy rich. Now the folks who WOULD be in the Technorati top 100 would be the writing speaking teachers that you perhaps more resemble in applied technique: the Sophists. I mean, think about what Gorgias would have done on a blog, you know? >>he reportedly was bald, didn’t have a good voice, and was a poor public speaker. And I agree with you on the Sophists, although most people today misunderstand who they were and what they did thanks to the modern negative connotation that “sophistry” carries. Going by your post Aristotle would have been a marketing guru had he been alive today. I’ve always been a great fan of ancient philosophers and thinkers because they were so ahead of their times; in fact, their wisdom is timeless and can be applied to any modern-day situation. You/Aristotle are right about the pathos effect. Nothing works better than strumming the emotional chords of the reader. Brian, I’m impressed that you’re going back in time digging and proposing solutions on writing – blogging – marketing. I’m wondering why you’re not using as a starting point later marketers who *wild guess* were based on Aristotle but gained more experience in recent years. This is critical. When you are writing and find yourself saying ‘I’, pause for a moment and try to think how you can reword it to shift the focus onto the reader with a ‘You’. If you have to say ‘I’ or ‘me’, make sure you bring the focus of your story back to the reader before you finish. Otherwise, all you have is an unlinkworthy cat blog. Remember, people want to feel like you care about them . . .
Gold star for the post slug and apostrophe! Titanis, nice to get a Greek perspective! Ahh, so you noticed, Quad. Next thing you know, we’ll be sending each other sublimal messages via RFID tags secretly woven into each other’s clothing. Damn ! That post I’ve been meaning to write about Sockertease has been trumped before I could get it on the big screen. since I’m the only one around here old enough to remember old Aristotle, I’ll say that was a mighty fine job-o-learnin’ ! What’s next – The 3 Best Posts That Confucious Didn’t Have Time To Write ? Keep ’em comin’, brother – you rawkes ! Nothing beats the charm of blogging tips written in Ancient Greek so i am told so i am sure i would be reading Aristotle’s blog too! Nice post, but i don’t think people would read Aristotle’s words today, because nowadays you have to be a “brand” to be listened to. BTW nice blog you have here. Just found it from the seomoz blog ranking post. That’s the reason for the Guy Kawasaki reference, btw. Guy is a really strong blogger, and when you combine that with his strong personal brand, he made it into the top 100 in no time, even though he didn’t start blogging until this year. I’m afraid that the only thing I know about Aristotle is that he “was a bugger for the bottle” (© Mony Python). I greatly admire your blog. Your Aristotle remix was fascinating. My only criticism is that you don’t go back far enough. We all know that Aristotle was wise, however everything that Aristotle and his students taught was gleaned from the Egyptians. Stephen R. Covey is one of the rare personal development writers that acknowledges the contribution that African wisdom made (and continues to make) to modern personal development ideas, management and, inevitably blogging. At his 8th Habit website, Covey lists the Ptah Hotep, (the oldest book in the world), written by the Egyptians, as one of the most influential personal development books of all time. There is a mass of literature for people who want to delve deeper into this area. 2 good sources for putting Greek thinking in it’s proper historical context are “Black Athena” by Martin Bernal and “Stolen Legacy” by George M. James. It was the ancient Egyptians that first taught “there is nothing new under the sun,” as your post so vividly demonstrates. Steve Covey’s book is awesome. Good post. This is great stuff. I’m sure you won’t mind that I’ve linked you from my blog. Your site is awesome. Thanks for the great post! Excellent ideas, I’m definitely saving this one for reference later. Our list is up if you’d like to look… have a great day! I found CopyBlogger from Problogger’s last writing project group, when somebody pointed here in one of their lists. You’re now bookmarked in my favorites and rightly so! Yeah, my Uncle Ari was pretty smart – and cool too. And yes, he was bald, and could have bathed more often . . . Thanks for putting into words what I have suspected all along. As a small business, starting our DeathToFilm blog brought up some serious time/productivity discussions. Can we “feed the blog” with original articles without loosing focus on our core business? “The same applies to you and your business. Someone in your field is going to connect with that motivated prospect and convert them into a customer or client. On DeathToFilm, we tell stories from cool jobs we have done as capture specialists at Image Mechanics. Most of those stories involve an interesting subject as well demonstrating how we solved a problem or overcame a difficult situation. Seminars and blog articles give us the voice to stand out among our competitors and helps establish our team as experts in the field. Time well spent. This was the most logical presentation of persuasive writing that I have ever read. You’re a genius. That must be why I’m taking your course Teaching Sells. Great job with this blog post. Sounds like we had some of the same English teachers. Find your writing tips excellent. You’ve given me lots of inspiration and ideas. Now I have to get to work on them. I look forward to receiving your new posts in my email. They sure cheer up a dreary, slushy New England day!